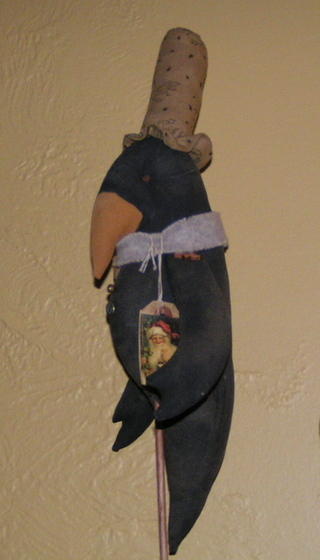 My mom and I, in another failed attempt to sell in a craft show, made tons of primitive items, including this Primitive Crow. I call him Russell. They were a lot of work--coffee and tea stained, painted, sanded, sewing, crying. Not a one sold. I like it though my house isn't filled with primitive type things. So my question is do I have bad taste, is my work bad, or is everyone else an idiot? Thanks for your comment. Daniel Craig, mmmm. I'm glad to have a fellow swooner. Thanks for your comment about Mr. Crow. I think we definitely tried to sell it in the wrong market. I might try to add a few to Etsy or Ebay. Heading over to your blog to check out your news. Anyway, just wanted to tell you that the a friend of mine makes primitive items and she sees a lot of ups and downs in popularity, buying times, etc. I also agree with the commenter above who mentioned the Walmartization of things. I used to work with a blacksmith and we made a lot of great, functional things. Everybody took one look at the plant hangers and said "I can get this for $15 at Wal-Mart." SO...what to do. I do think the crow is very cute! Don't be discouraged. I think unfortunately with the Walmart economy we live in today most people get sticker shocked when the see the price of an actual hand made piece of art. Rather than looking at it as art, they view it as an item to purchase as decor for their home. Perhaps you could have emphasized the process you did to create them. This is a guess, for I have no idea how much you asked for it. Was anyone successful at the show? If so, what separated them from you? By the way, I think the crow is cute. I appreciate it more knowing how much work you put into it. Okay, I still think they look great and were a good idea!